Some say the Betharram Grottos are the most beautiful in France. If you want to find it out by yourself, come to Betharram to learn about the formation of most of the grottos. The Betharram Grottos were the first Grottos in France to be opened to the public and can be visited since 1903. Located between Pau and Lourdes, they are opened to visit from February to October. 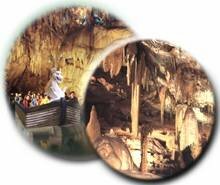 There, you will have fun learning how the grottos form, as well as the stalactites and stalagmites. Prepare to experience a great adventure of about 1h20! You will go through a mountain, take the little train and even travel by boat. From this former river, a tributary of the Gave de Pau, you will observe surprising erosion phenomena. The audio explications are available in 7 languages and complement the friendly, dynamic and pedagogic presentation of the guides. While visiting the Grottos, you can also make a stop at the Bétharram Shrine. The Betharram Grottos are 4 km away from the picturesque village of Betharram. Make the most of your trip and visit this place of pilgrimage, famous since the 15th century, the shrine of Betharram and the wayside. The Betharram Grottos are accessible to people with reduced mobility.